Naturalist Charles Darwin (1809-1882) was born into the influential Darwin-Wedgwood family. His paternal grandfather was poet Erasmus Darwin; his maternal grandfather was master potter Josiah Wedgwood (1730-1795). Members of the Wedgwood family were prominent abolitionists, and their renowned pottery business remained in the family for five generations. Somewhat surprisingly, given his own genetic research, Charles Darwin married his first cousin, Emma Wedgwood (1808-1896). Other notable members of the Darwin-Wedgwood family include eugenicist Francis Galton (1822-1911) and composer Ralph Vaughan Williams (1872-1958). 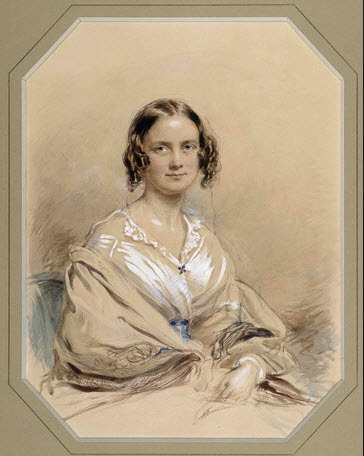 George Richmond, “Emma Wedgwood Darwin,” ourheritage.ac.nz | OUR Heritage, accessed April 26, 2019, http://ourheritage.ac.nz/items/show/10423.